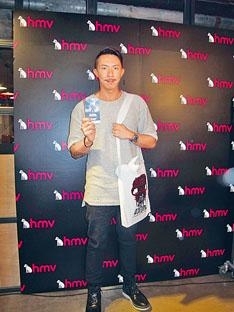 Artist Louis Cheung Kai Chung last night attended his new film ZOMBIOLOGY: ENJOY YOURSELF TONIGHT (GUM MAN DA GEUNG SI)'s autograph session at the Causeway Bay hmv. He said tha aside from his first zombie film, he also worked for the first time with his buddy Michael Ning (Bak Ji) and the band Juicyning. Did Ah Chung have any box office pressure? He passed the ball to Bak Ji. "Of course it's on Bak Ji! He had such a good performance at the Hong Kong Film Award and the Golden Horse Award! His acting absolutely won't disappoint anyone. I am optimistic about the box office because Hong Kong really have a lot of people in the know." Ah Chung will be busy with film in the second half of the year. Ah Chung said, "I am a practical use actor, young people aren't about compensation. It all goes to the family anyway."